Overhead Trolley and Plug-In Busway Electrification Systems. 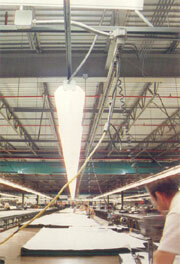 On February 2, 2004 Universal Sewing Supply acquired the Feedrail® product line from Thomas & Betts. Genuine Feedrail® ... If it doesn't say Feedrail, then it isn't. Genuine Feedrail® delivers Flexible Overhead Power and Control of Equipment in Motion. Vast experience in complete system installations. Preferred by thousands of satisfied customers worldwide. 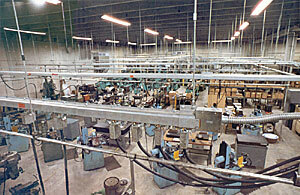 Easy to use electrical plug-ins and trolleys installed in seconds to meet production requirements. An affordable system with proven economic benefits. Long lasting, heavy duty, high quality components. Simple to maintain and clean. Design and engineering services available. Feedrail® offers a complete line of Overhead Trolley and Plug-In Busway Electrification Systems. 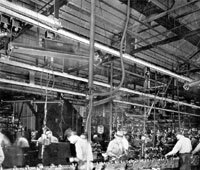 With almost 100 years in the business, we understand moving applications, and can address the questions and problems involved in selecting a power source that will move with your application. Feedrail® developed a moving source of electrification to answer the needs of the sewn products and automotive industries which were evolving into large, mass production processes. 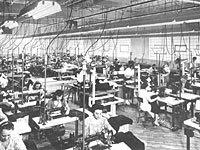 In sewn products, for example, movable power outlets were needed for sewing machines. 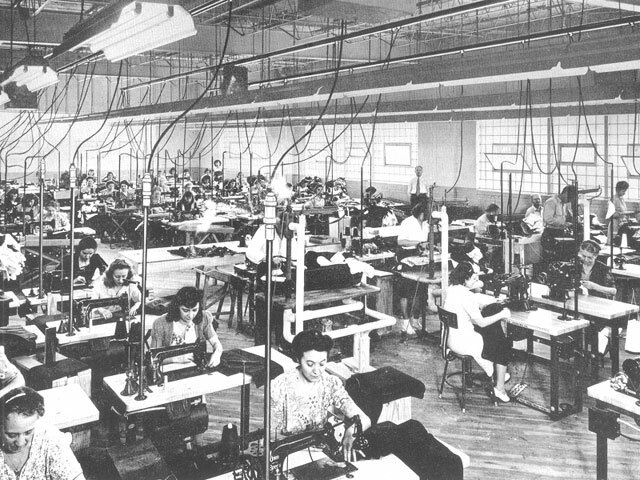 As production layouts changed, rearranging of sewing equipment became much easier. 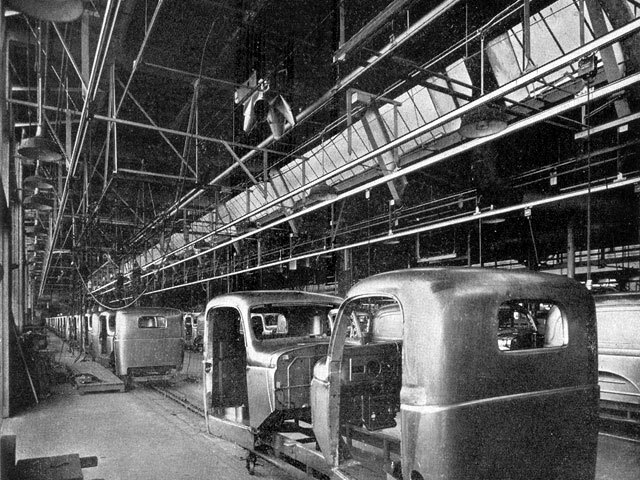 Production was no longer delayed, and the end result was increased productivity. Feedrail® Systems have become more and more sophisticated over the years. You'll see them in abusive heavy-duty application such as steel mills and rapid transit systems. 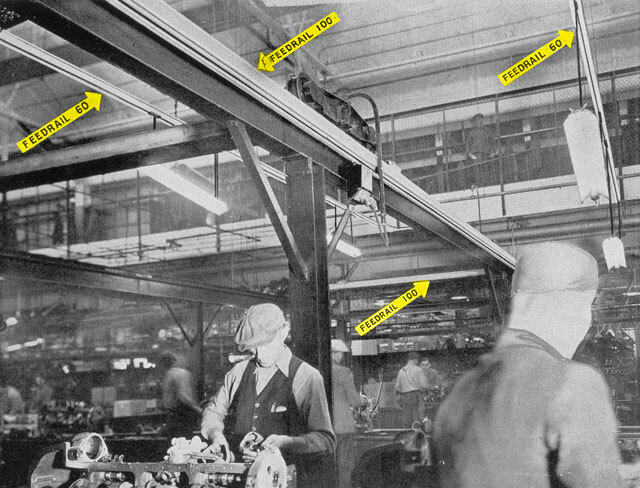 In high-tech industries, Feedrail® Electrification Systems are being used to perform testing and burn-in functions at electronic assembly plants. No matter what your application, we can engineer a system to meet your electrification requirements. 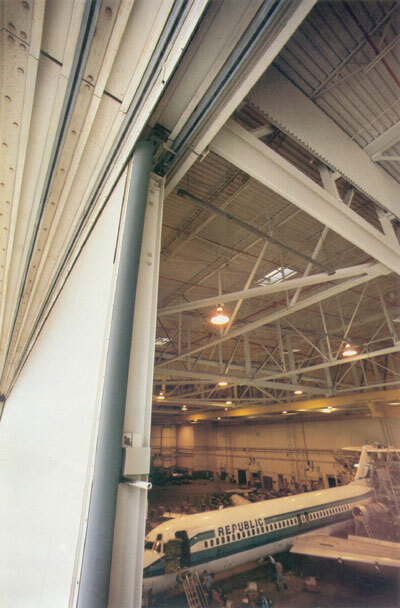 Systems are designed for indoor use in non-hazardous, non-corrosive, dry atmosphere. Simple design leads to quick installation. 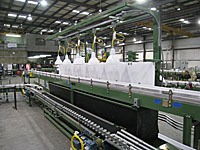 Feedrail® Systems are manufactured of standard units that are factory preassembled to save time on the installation site. Our systems install with just a wrench and a screwdriver. You can add to, modify, change, or tailor any of these systems to meet your needs quickly. Compact design equates to dollar savings. Our Feedrail® Trolley Busway Systems incorporate all power conductors into one housing minimizing installation costs. Quality design and construction means superior safety. Feedrail® Overhead Electrification Systems assure the safety of your personnel and operate dependably at any level from ceiling to floor. 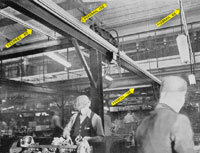 Since all currency-carrying components are enclosed, the hazard of personnel accidentally coming in contact with live current is eliminated. Feedrail® Electrification Systems are U.L. Listed and C.S.A. Certified where applicable. Why are Feedrail® Systems the best? Heavy duty 13 and 18-gauge zinc coated steel track casings. Fully enclosed hard-drawn copper bus bars which resist overheating and protect personnel. 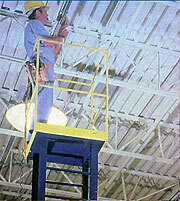 Conductors are easily removed for maintenance and require no special tools. 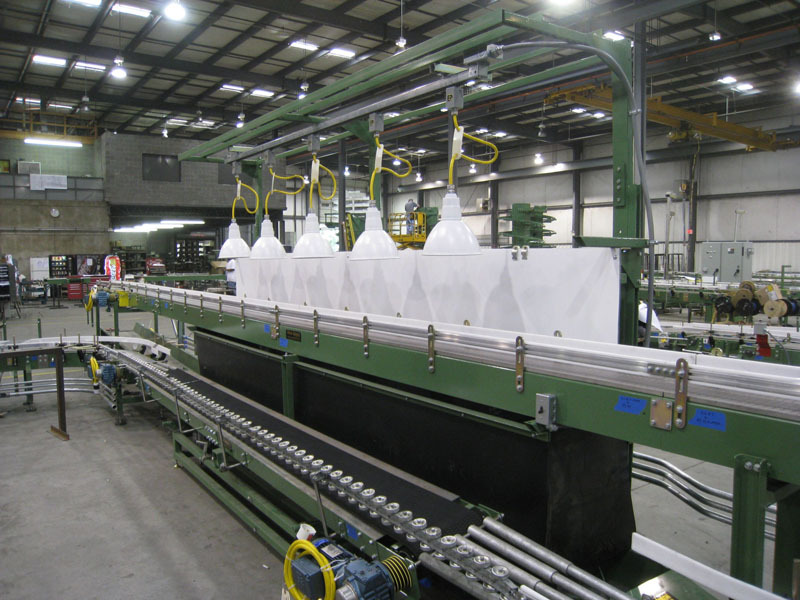 Easy track maintenance with insertable Feedrail® Cleaning Tools. Track insulators and trolley insulator blocks made of high arc resisting material. Horizontally mounted ball bearing guide wheels on trolleys prevent slewing. Quarter turn plug-in jacks which lock into place for easy relocation. System is installed in sections for easy disassembly and reassembly to meet production requirements and easy maintenance. Heavy duty hardware for long lasting performance. Wide range of electrical ratings. We provide a total range of listed and certified electrical systems from 50-1,000 amperes. Most Feedrail® Systems are listed by the Underwriters' Laboratory, Inc. 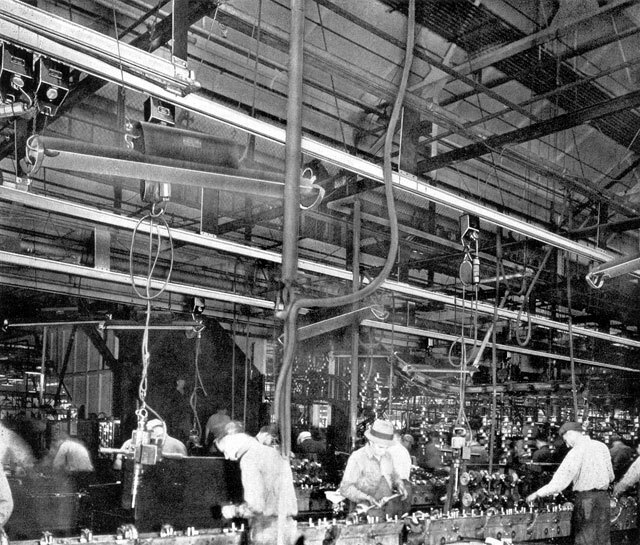 The National Electric Code governs their installation. The equipment is designed and manufactured for use under this code and will meet the requirements listed in the Code if installation is in accordance with its provisions. However, interpretation of local inspection authorities should be sought for specific rules in your district. Minimum maintenance and dependable performance. Because they're so well constructed, Feedrail® Electrification Systems will deliver years of trouble-free, reliable service. Once installed, your Feedrail® Electrification System is virtually maintenance-free. Periodic inspection and cleaning is all that's required. Feedrail® ... the genuine track to safety. - 600 Volts A.C. - 250 Volts D.C.